President Trump took to Twitter to respond to Kim Jong Un’s claim that he has a nuclear button on his desk at all times. Honestly, I literally laughed out loud. 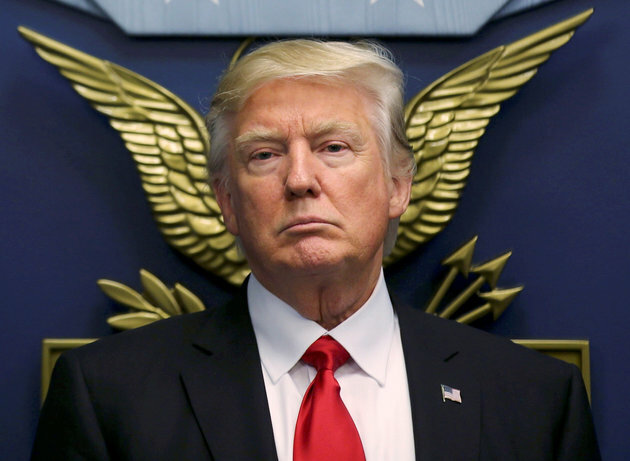 It’s typical Trump fashion but equal parts savage. 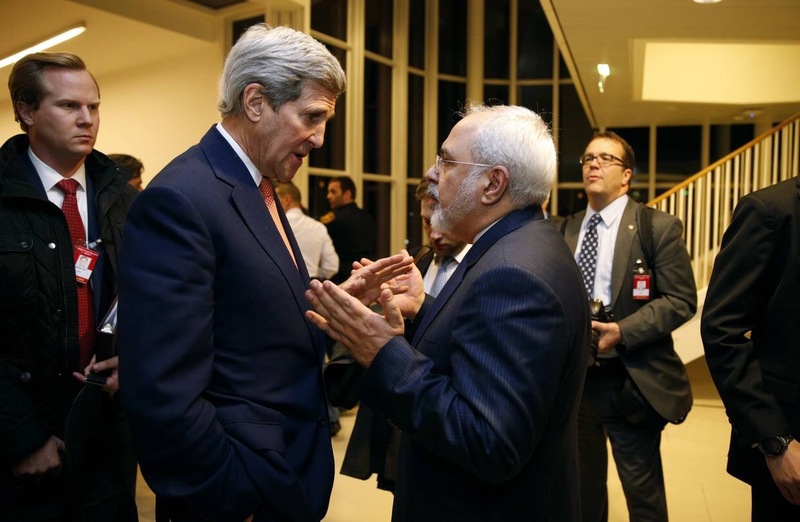 PODCAST: Peace in the Middle East? 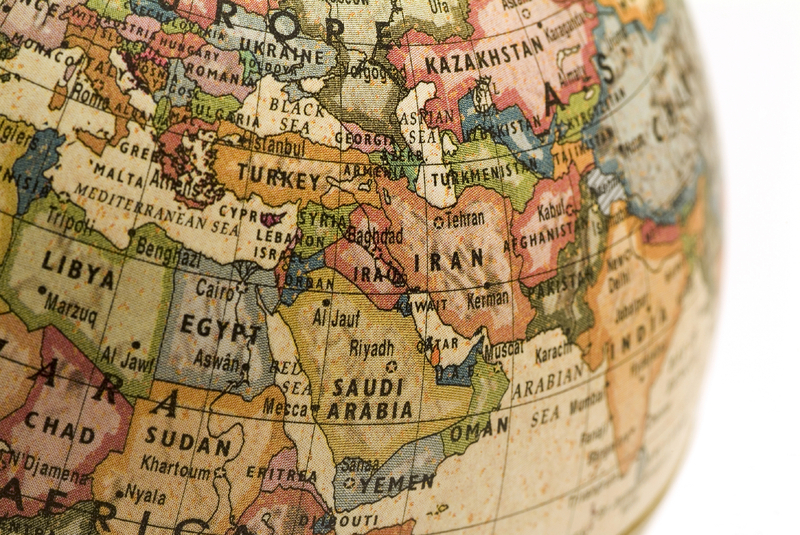 On this podcast, we talk about the unraveling in the Middle East. Are we finally getting to a point where we will see peace in the Middle East? No. And, as a matter of face, it’s only going to get worse from here. You see, about 6 years ago, Iran was chattering about the next caliphate. And, a lot of people thought it was crazy to talk about it then. However, those times have changed now that other things have come into play. Even when we did the Chess episode a year or so ago, we missed a very important piece of the puzzle: IRAN. They’ve got their dirty little hands in so many places around Saudi Arabia, it’s like they are trying to put the chokehold on them. The NAACP in California wants to remove the Star Spangled Banner as the national anthem. We continue to dissect the Declaration of Independence, line upon line. Did you see the video USA Today put out with chainsaw bayonets? 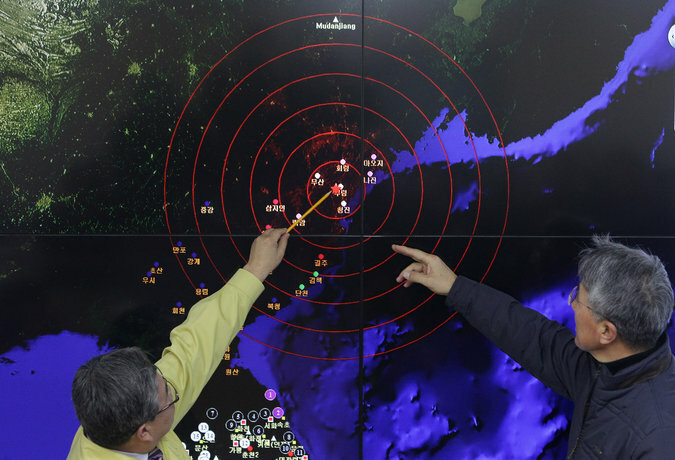 The nuclear blast was carried out at the Punggye-ri site at 12:29 local time, triggering an initial magnitude 6.3 earthquake, followed by a magnitude-4.1 temblor that was possibly caused by a structural collapse, according to the U.S. Geological Survey. 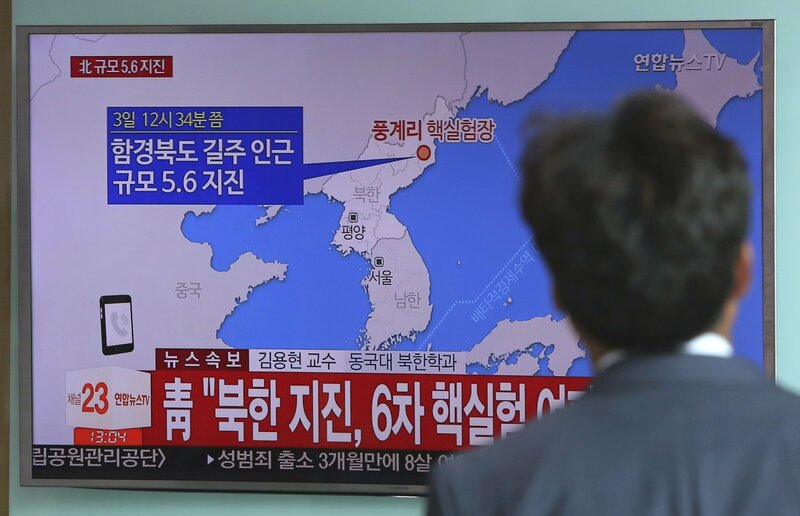 The test was estimated to have a yield of 100 kilotons, meaning a blast that was four to five times more powerful than the explosion in Nagasaki, Japan, in 1945, a South Korean defense official told the country’s Yonhap News Agency. So apparently, Russia is out hacking our energy grid. Or at least that’s what some news outlets are reporting. However, it’s much ado about nothing really. How is it nothing if Russia is hacking our grid? Well… it’s that whole #FakeNews thing. 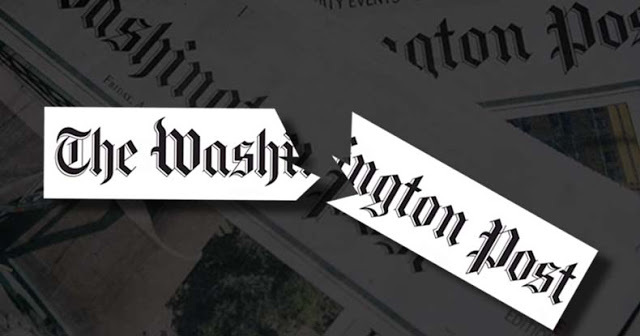 One media place says one thing, another basically reports on the same thing, and the next thing you know, it’s all the buzz. But the devil is in the details! With just a little homework – and actually reading what was originally posted – you realize that everything was safe and sound and there was no threat at all. Seriously! They even said it in the original report. ISIS is suspected of firing a shell with a mustard agent that landed at the Qayyara air base in Iraq Tuesday where US and Iraqi troops are operating, according to several US officials. The shell was categorized by officials as either a rocket or artillery shell. After it landed on the base, just south of Mosul, US troops tested it and received an initial reading for a chemical agent they believe is mustard. A US defense official said troops had gone out to look at the ordinance after it landed. Based on seeing what they thought was a suspect substance, two field tests were conducted. US troops involved in the incident went through decontamination showers as a precaution. No troops have shown any symptoms of exposure, such as skin blistering. 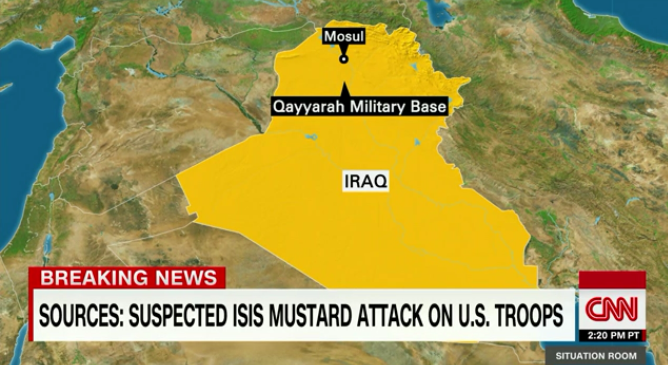 CNN has reported on previous instances where ISIS has fired rounds with mustard agents in Iraq and Syria.”I don’t know of a case like this where it was proximate to US forces like this before,” said one military official, noting that “potentially” the rocket round was “within hundreds of yards” of the US forces and “within the security perimeter” of the base. The US officials said they “had expected” that ISIS might try to use chemical weapons as US and Iraqi forces push towards Mosul in an effort to take the city back from ISIS. Several hundred US troops are using the base as a staging area for supporting Iraqi forces. He couldn’t be any more correct! This is something we absolutely must remedy. Think about it what he said in context to the 2016 election. 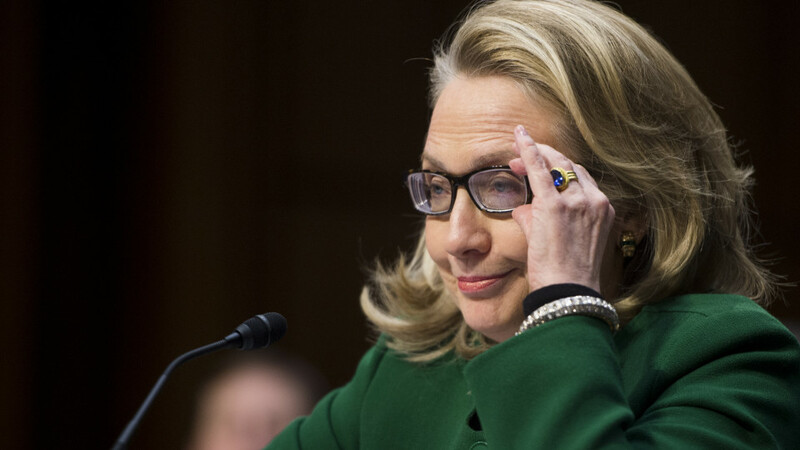 During the Benghazi attack, Hillary Clinton was the Secretary of State. It happened under her watch. Did she answer the 3:00 am phone call? Nope. She, along with many others in the Obama administration, sat and watched it happen. Then… then they came up with the crazy idea that it was a spontaneous protest that resulted from a YouTube video! And now she’s the presumptive nominee for the Democrat party? Iranian Supreme Leader Ayatollah Ali Khamenei awarded the ‘Order of Fat’h’ medal to the commanders who captured U.S. sailors. 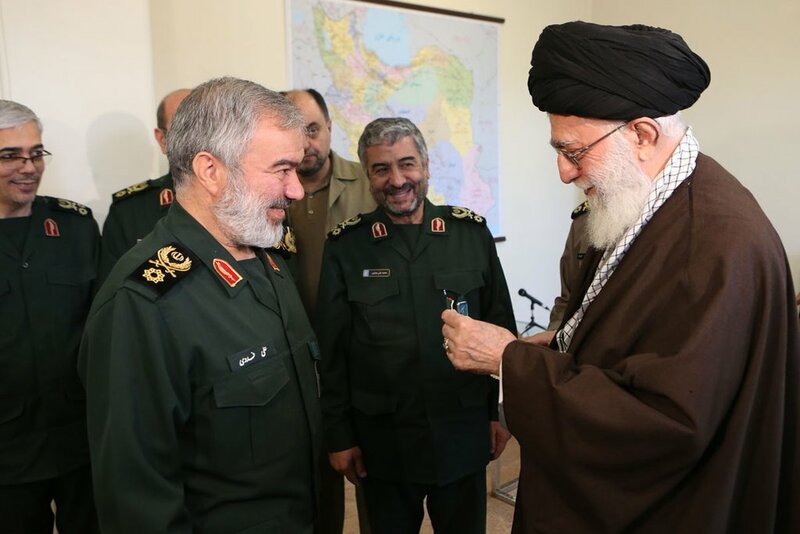 According to Iran’s English-language Press TV, Rear Admiral Ali Fadavi, commander of the IRGC Navy, along with four other commanders “for arresting the trespassing US sailors” received the Fat’h (Victory) medal.